Free Printable January 2020 Calendar. Print the free January 2020 Calendar and use to get organized at work, classroom or at home. Maybe you need a little help remembering things you have to do this month. 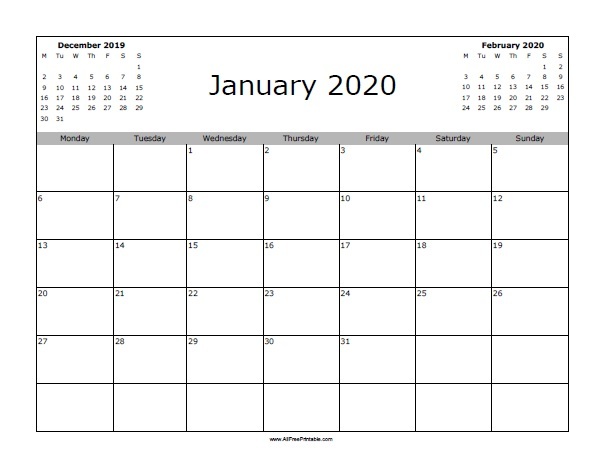 You can write down all the important events, things to do, party, appointments, concerts, TV Show premiere you don’t want to miss, due dates, business meetings, school project, holidays, friends birthdays and more this month of January 2020. Select from 2 options of calendar starting the week on day Monday or Sunday with previous and next month at top left and right. Available in easy to print PDF format. Use the link of your choice to download or print the January 2020 Calendar free.